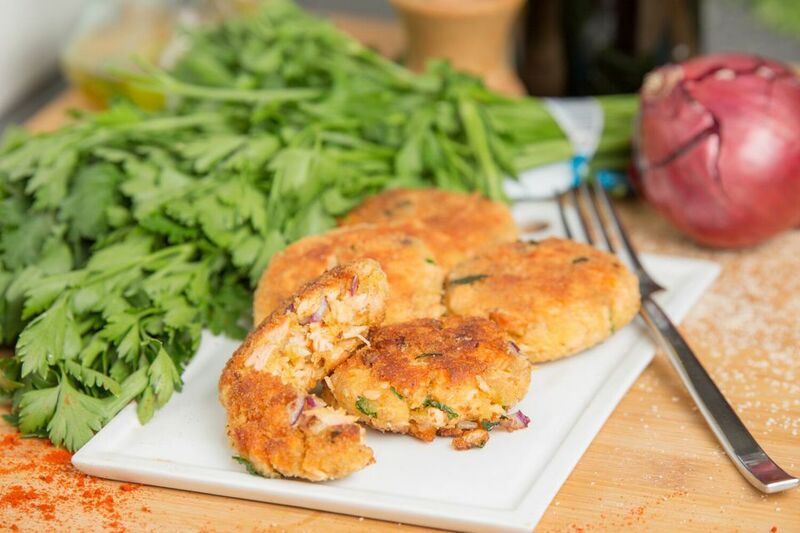 Salmon cakes are usually a way to use leftover cooked salmon. These are so good that you may find yourself cooking up some salmon just to make them. If nothing else, you may as well cook up an extra filet or two to make them the next day. Serve these delicate yet flavorful patties with a big arugula salad, as pictured, dressed with this lemon garlic vinaigrette, which adds a nice acidic kick when eaten with the salmon, too. In a medium bowl, combine the salmon, onion, parsley, salt, pepper, and cayenne, if you're using it. Mix to combine everything thoroughly. Move the mixture to the side of the bowl and crack the eggs into the now sort of empty section of the bowl. Use a whisk or fork to beat the eggs. Gently combine the salmon mixture and the beaten eggs. Mix gently just to combine. Don't overwork the mixture after you've added the egg or the patties can lose their supremely tender texture. Stir in the panko or breadcrumbs. Add 1/3 cup and combine with the salmon mixture. Take 1 tablespoon of the mixture and try to pat it together. If it holds, great; if the mixture doesn't come together, add another tablespoon at a time until it does. Spray your hands with cooking spray or oil them with olive or vegetable oil and form the cakes. Make them about 3 inches across and an inch thick. Place them on a baking sheet, cover, and chill for a few hours for the best final results. Optional: Dredge the cakes in flour or breadcrumbs. Heat a large frying pan over medium-high heat, add some vegetable or olive oil for cooking (for crispier cakes, consider creating a real slick of oil for the cakes to fry in; or keep things less oily and just coat the pan), and cook salmon cakes, as many as fit in a single uncrowded, not-touching layer in the pan, until golden brown on one side, about 4 minutes. Turn over and cook until golden brown on the other side and cooked through, another 4 minutes. Repeat with any remaining cakes. The step for dredging the patties isn't necessary, however, it does create more of a "crust" when the patties are cooked. Know, however, that the patties will hold together and brown just fine without this coating and it's quite messy to do.